Commercial: Analyze the market in which the ideas of the project will provide competitive advantages in order to guarantee the explotability of the results obtained from it. Technical: the current state of the art will be analyzed in those particular technological areas in which desirable and objective improvements of the project have been identified. Requirements and integration: The main objective of this activity is to ensure that all work carried out in the most technical activities (PT2, 3 and 4) meets minimum requirements, meets or proposes standards, is interoperable with each other and can therefore carry out an overall assessment of the technologies investigated. WG2: The first objective is to refine the LHE algorithm in the aspects of coding and spatial compression. Specifically in the most accurate estimation of luminance and to achieve a greater elasticity in downsampling algorithms, which will make the final algorithm a more versatile tool for any scenario, whatever available bandwidth conditions. The second is the effective generation of motion vectors based on temporal hops that allow such calculation to be performed with a degree of reliability sufficient to match other more costly computational methods such as spatial convolution, widely used in standard algorithms. At the same time, this calculation will be achieved in a fraction of the time required by the current methods, which consume most of the total coding time. 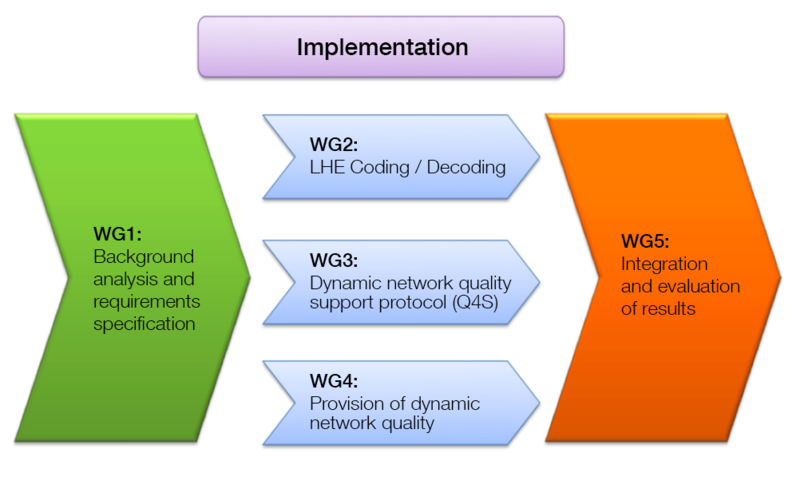 The third aim relating to decoding is to make a number of improvements over the current LHE algorithm.Specifically, we will work on a variable resolution interpolation algorithm based on advanced interpolation algorithms such as “HQX” or “XBR” and later on the combination of various interpolation methods that allow us to optimize the final quality based on the compression ratio applied. In each case and depending on the degree of compression, the best interpolation technique may be different. On the other hand, each interpolation technique has a different computational complexity and this will be taken into account as options of the decoder. Develop an experimental asset that implements the Q4S protocol based on the IETF specification. Develop a prototype video streaming platform that reacts to alarms generated by the Q4S protocol. Develop a prototype plug-in for virtualized software from the gaming anywhere tool that reacts to alarms generated by the Q4S protocol. Define an integration architecture between Q4S-generated alerts and network elements. Define dynamic quality of service allocation policies based on user requirements and operator restrictions. Develop a prototype of an Openflow-based expert system that implements these policies with Q4S (network policy server) alerts as inputs. Integrate the expert system into a demonstrator pilot. WG5: After the activities dedicated to individually investigate technologies associated to the efficient provision of quality of service to the user, an activity dedicated to evaluate the benefits of the solution globally. This PT is defined, with the aim of drawing technological conclusions from the combined activity of ARQUEOPTERIX and validate its correct operation.